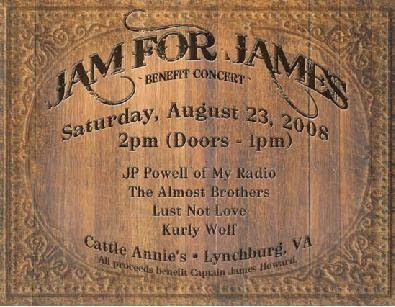 Dave Hargis, drummer of the band, Kurly Wolf headed up to Virgina to raise money in a benefit concert for Captain James Howard. Dave and James met in middle school and have remained friends even as their lives have taken different paths. Dave moved to Charleston and James served in Iraq as a Captain in the Army and trained to be in the Special Forces. His life was altered earlier this year by a swimming accident that left James paralyzed. Friends and family members immediately rallied around James and continue to support him through this tragedy. Dave Hargis, Nick and Dennis, members of Kurly Wolf, knew that they wanted to be an integral part of this fundraiser to help lighten the financial burden. We are proud to announce that Kurly Wolf and three other bands raised over $12,000 for James as he continues treatment and rehabilitation.